"Amelia” is a beautiful example of this timeless Jack Hargrave design. The large interior volume and practical arrangement plan have made the Hatteras 53 the most successful medium sized motor yacht ever built to date. Boasting lots of quality, very recent, upgrades, this is a very sound and capable yacht with many years of enjoyable boating life remaining. Her paint, windows, bottom, interior, galley, electronics and mechanical's are all up to date and have recently been serviced or upgraded. 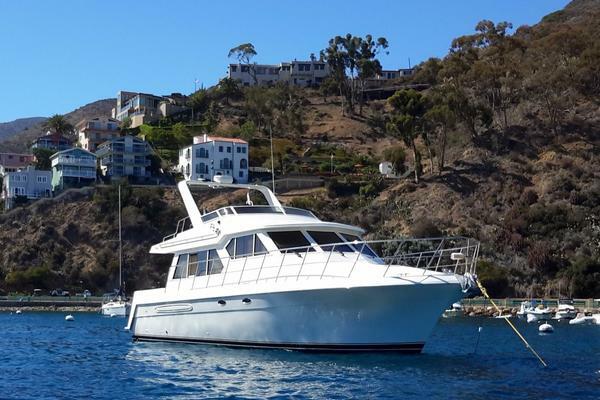 United Yacht Sales New Jersey would love to guide you through a personal showing of this 53' Hatteras 53 Classic Motor Yacht 1973. This yacht for sale is located in Palmetto, Florida and priced at $174,000. For a showing please contact us by filling out the form on this page and we will get back to you shortly! The entrance into the salon can be from either the port and starboard side doors or from the aft deck through two hinged swing doors. The salon is spacious, with surrounding windows that allow in natural lighting. The salon has all new furnishings and a Simulated "Teak and Holly" sole. There is an L Shaped sofa to port and a matching sofa to starboard. The new TV is mounted on the aft salon bulkhead to port. Forward is the fully instrumented lower helm. Aft of the salon there are double doors to a very large aft deck with ample seating, and a wet bar to the port side. There are port and starboard wing doors leading out to the covered walk around side decks. There are port and starboard boarding gates at mid-ship both accommodating the single tide rider boarding ladder. On the foredeck features include sun-pads and built in cushioned guest seating. Leading down from the starboard side forward in the salon is a curved stair-well down to the lower level. The galley has all new full-sized Stainless appliances and Quartz counter tops with a new "Teak and Holly" sole. Forward is a private cabin with lower and upper berths and an en-suite head with shower. new "Teak and Holly" flooring in the stateroom and quartz countertops. Aft of the galley on the port and starboard sides are the engine rooms with great engine access. The generator room is beneath the galley sole. Further aft is the private guest stateroom, with two single berths and furthest aft is the master stateroom, with two single berths and a large hanging closet. There are two complete side by side heads with a shared stall shower for the two private aft cabins. The main salon has many recent traditional upgrades including new simulated "Teak and Holly" flooring. There are sliding windows (with newer tracks and slides) all new furnishings and lamps. All new wooden louvered blinds. There is a portable helm chair, throw rugs and coffee tables. Furnishings are all lightweight resin with internal storage. There is a new Flat panel TV mounted on the aft port bulkhead. The galley is down with excellent storage and totally updated . New appliances installed in 2016. New quartz counter tops with designer faucets and Simulated "Teak and Holly" flooring. The forward stateroom has upper and lower berths with drawers under lower berth. Private head with shower, sink and new quartz counter tops and bathroom fixtures. Aft of the engine rooms to port, is the guest stateroom with two twin berths and a large hanging locker. The master stateroom is all the way aft and features twin berths (2), with wall to wall carpeting. There is a verylarge hanging locker, chest of drawers, and drawer storage under berths. Featuring a very large covered aft deck with newly upholstered seating and storage beneath. There is a rear gate that takes one down to the new fiberglass swim platform. There is also a ladder to access the fly-bridge from here. There are port and starboard wing doors as well as fiberglass weatherboards to allow for all weather usage of this area. New in 2016 a Cummins Onan 17 KW Generator with a sound shield and all new exhaust, fuel filter and battery. Twin Detroit Diesel 8V-71 Diesel engines.Both engines received major servicing in 2016 to include the complete cooling system and exhaust systems. Engine Hour meters show 1042 and 1047. Previous surveyor opinion-ed he believed them to be accurate. Engines appear to run well. Start clean with very little smoke. Engine hours are reported as viewed on meters. Since March of 2016 over $100,000 has been invested in "Amelia' by professional technicians. New Swim Platform, Transom Ladder, and Gate. Boat was repainted in any areas where it was needed. All new "Black Out" covers for port lights in staterooms. 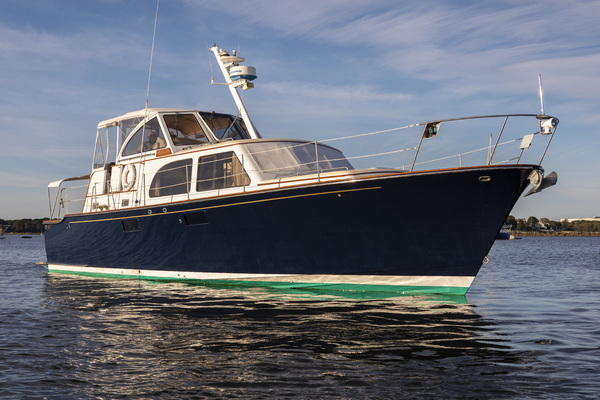 "Amelia" is a classic Hatteras Motor Yacht with an original teak interior. She has recently completed a major refit and reconditioning of the yacht which has only added to her original charm and warmth. She shows as a low hour, greatly loved yacht, which has many quality, and tasteful, upgrades. The most popular full-sized motor yacht ever built by the top name in Yacht construction. 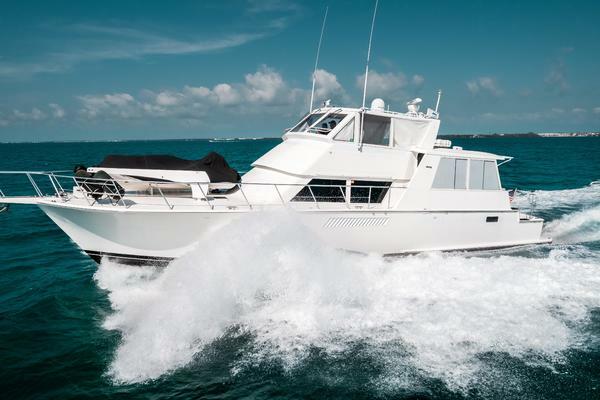 You cannot go wrong with an older Hatteras, and this 53 Classic is a great example and rare opportunity for a discerning buyer.